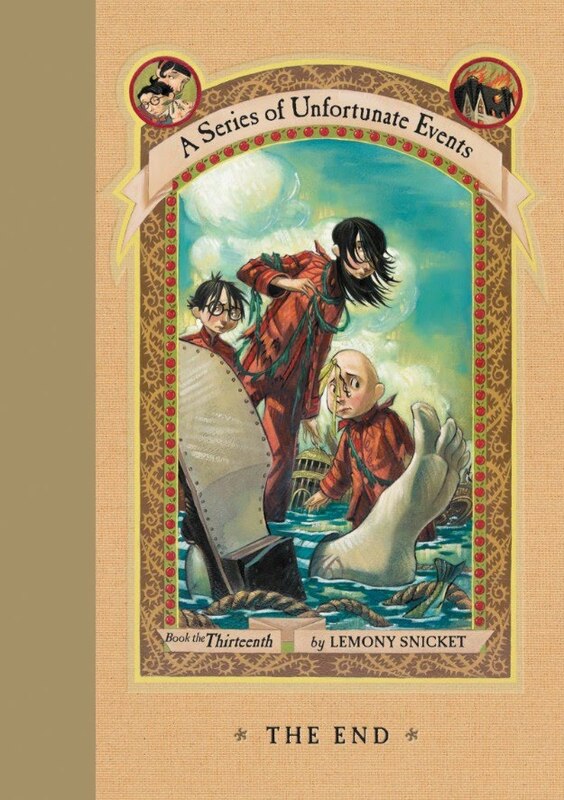 Wow, welcome to my review of the last book in Lemony Snicket's A Series of Unfortunate Events. And after all the clever titles used for the 12 other books before this one, they just went with The End. And as much as things have been building up over the past few novels and all that had been revealed about V.F.D., I don't think anyone could have predicted that this was how things were going to wrap up. But I'm not complaining. The books revealed a lot of depth to Lemony Snicket's writing and what I supposed you could surmise to be his thoughts on a number of subjects beyond the events in the book. And we'll probably spend a better part of our lives discussing the implications of what he managed to create across the 13 books of this series. But we also get a satisfactory end for the journey of the Baudelaire children. We can't forget that important bit. 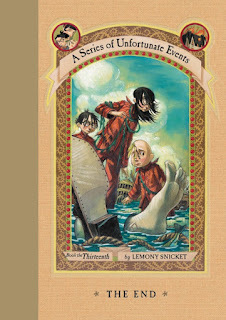 Synopsis: The End is the 13th and final book of Lemony Snicket's A Series of Unfortunate Events. There are other companion books for the franchise beyond this one, but for the most part the series ends here. We start right after the events of The Penultimate Peril with the Baudelaires sharing a boat with Count Olaf as they escape the events at the Hotel Denouement. A fierce storm brings them to an unusual island that takes the Baudelaire children but reject Count Olaf due to his attitude and vile threats. They are later joined by Kit Snicket, who has somehow floated over on a pile of books together with the Incredibly Deadly Viper from The Reptile Room. After all the excitement and terror of recent events, the Baudelaire children start to find actual rest and comfort on this peaceful island with its helpful little community. Sure things seem specifically crafted to maintain a particularly bland tone of life but boring means less danger, right? But over time they find that a lot of the rules that had been put in place feel oddly restricting to the point of being counter productive, especially given their naturally inquisitive minds. How long can they remain on the island and avoid the troubles of the outside world? What I Liked: The drastic shift in tone for this book versus all the others was rather jarring at first as any other book would end with some some of big confrontation with the villain who has chased and tormented our heroes for so long. But instead we start with the villain sharing the same boat with them and yet being left out by the odd island community from the very beginning. They don't even get fooled by another of his disguises that had fooled so many others across all the past titles. And this made for a very interesting setting to start the last part of this greater story. And there are so many lessons brought forward in this book as a culmination of all that had come before. Everything that the Baudelaires had experienced across the series became rather important in this final chapter yet also irrelevant to how the characters would eventually move forward. This is more than just a story of good versus evil. And that's where the genius of this book really lies as it gives a new layer of meaning on top of everything that had come before. What Could Have Been Better: That said, the unusual direction of the final book can lead to some disappointment over how things resolve. You want that big finale between the two sides of V.F.D. and to maybe get a clean resolution to everyone's character arcs. But we don't get that sort of an ending and while one cannot argue if the actual ending was better or worse that sort of expectation, it was certainly different and surprising. And I'm not sure how onboard I was for how we ended with yet another group of people we didn't know with their own set of problems that to some degree need to be resolved or at least dealt with just like all the other books despite things coming to a close. So that initial part that felt too much like when the Baudelaire children first being brought to a new group of people who could possibly take care of them and that, like many of the past delays revealing more about V.F.D., felt like a bad call. It makes sense later on but at first it felt odd and jarring. TL;DR: The End is a great ending to the series which I suppose can be a little controversial for some. But if you get past that shock, the book has a lot of great moments and things that even re-contextualize past adventures in a great new, and perhaps philosophical, light. Thus the book gets a great 5 secrets of the Baudelaire family out of a possible 5.